The podium trio of the Men's Olympic Mountain Bike Race gathered for a few quick photos before moving on to their medal ceremony. I wonder if they would shower quickly and get to the Olympic Park for the Closing Ceremonies. Raising his arm in a victorious salute is the Gold Medalist, Nino Schurter (Switzerland) to his left is Jaroslav Kulhavy (Czech Republic) who won Silver, and on the other side is the Bronze Medal winner Carlos Coloma Nicolas (Spain). It was a fine race, even if Peter Sagan wasn't a player after the first two laps. 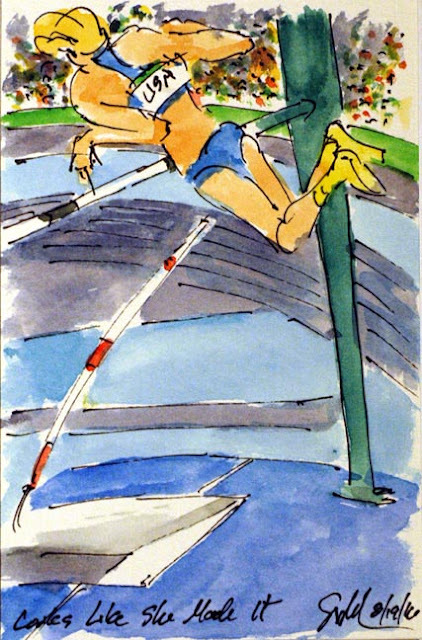 This is a small watercolors and ink painting measuring just 4"x6" and was created using Yarka St. Petersburg watercolors and Steve Quiller brushes from www.richesonart.com. 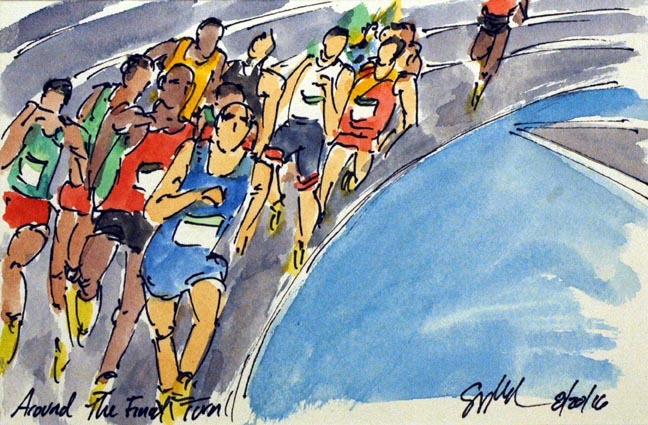 This painting and all of my Olympics artwork will be available through my artist website at www.greigleach.com. To purchase this particular painting just follow the direct link at the end of this post. 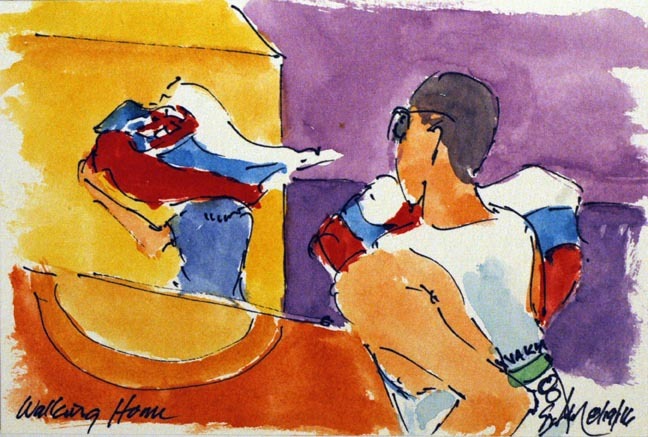 Remember this is an original work of art, so once it has been sold, it is gone. Don't delay buy it now! Unlike the Women's race, the Men's was plaqued by crashes and traffic jams. The wet, muddy course was much more difficult to negotiate than the dry one that the women faced. Or perhaps the cameramen didn't want to show bloodied women stuck under their bicycles. 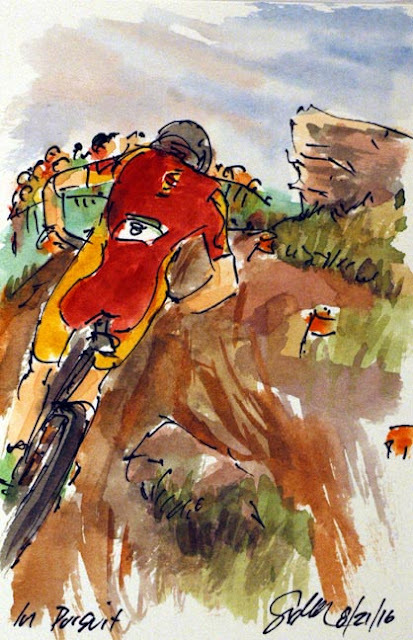 Alexander Gehbauer (Austria) got his front wheel caught as he descended the steep stepped logs after a fast twisting downhill section. This was his second crash in about a half of a mile. The first had him landing on sharp boulders, at least this landing pad was mud and grass. Small favors. Rio Olympics: Do Some Work! Further back from the leaders, riding fifth and sixth on the course were Mathias Fluckger (Switzerland) and Jhonnatan Botero Villegas (Colombia). Fluckger appears to be frustrated with the Colombian sitting on his wheel. As the duo come through the finishing straight for the bell lap, Fluckger tries to get Botero to come around and help chase those up the road. Both were too far back to have any realistic hopes of getting on to the podium with just one three mile lap to go. Peter Sagan (Slovakia) may have been regretting his decision to skip the road race and to take on the mountain bike trail above Rio. Sagan had a great two laps until he had a flat tire. Unlike the road race with neutral service vehicles and team cars behind the racers, Sagan had to ride the flat all of the way to the service area. With that, his race was basically over. He got back on two minutes back and just kept losing time to the leaders there after. He was caught by the camera man dismounting to descend a difficult rock strewn obstacle, not the fastest way to get down, but better than crashing. The Spaniard Carlos Coloma Nicolas, decided he didn't want to come to the line with Maxime Marotte on his wheel. So on the penultimate lap he went off on his own, partly in hopes of chasing down the two men up the road, but mainly to come to the line without fear of being out sprinted for Bronze. The course was "spectator friendly" whatever that means, but it was true that hundreds of mountain biking fans lined all of the tricky parts of the course. Although some seemed more interested in taking selfies with the racers in the background than they were in the race itself. The Women's Mountain Bike race was contested on dusty roads yesterday, but the rain overnight left the men racing on slippery muddy roads. 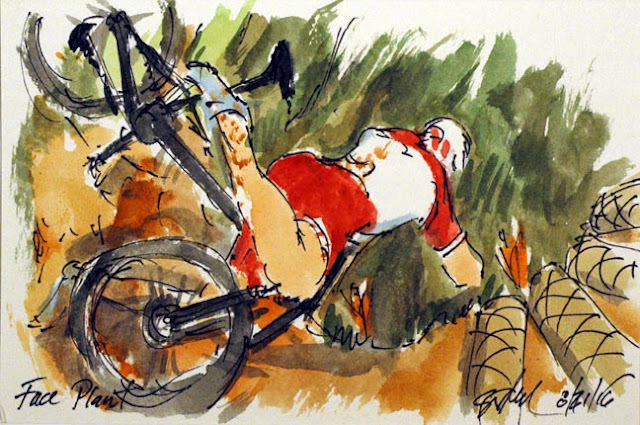 Literally slipping off the front was the Swiss rider, Nino Schurter with the Czech, Jaroslav Kulhavy chasing him through the rock strewn woods, splattering mud on themselves as they go. The duo had contested for the Gold Medal in London four years ago, and it looks like they would repeat the effort in Rio. 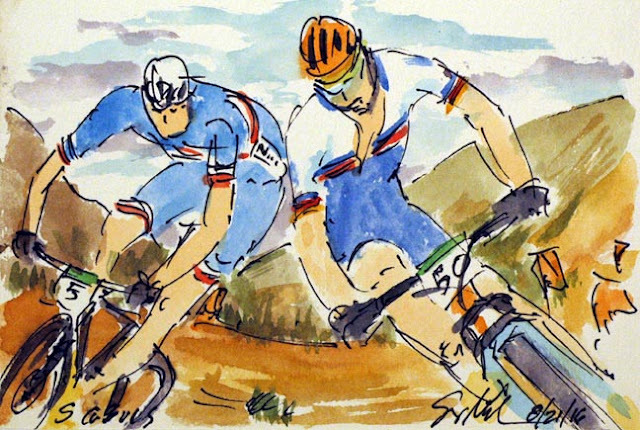 The UCI World Road Champion, Peter Sagan (Slovakia) had given the Olympic Road Race a pass so he could race the Men's Mountain Bike race on the last day of the Olympic Games. 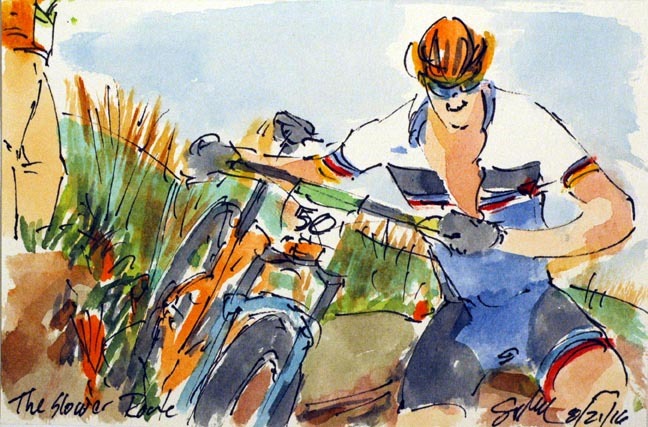 Since Sagan has been busy on the roads of Europe (and the rest of the world) he was ranked nearly dead last in the UCI Mountain Bike Association. Given that he started in the very last position as the event got underway. No matter, Sagan was quickly amongst the leaders, in fact he was third wheel on the first lap. Sagan is known for his bike handling skills on the road, but he is a former Junior Mountain Bike World Champion. The Slovak was chasing down through a twisting descent with Victor Koretzky (France). I knew that Feyisa Lilesa's (Ethiopia) gesture meant more than just a signature gesture, think Usain Bolt's lightening bolt pose, but I admit I had to research its meaning. After the race, I read an article from the LA Times, that indicated it was a gesture of protest of the Ethiopian Goverment's killing of the Oromo people When asked about it, he felt that he will face prison or death on his return home. A brave way to bring the attention of the blight of Ethiopia to the world stage. His Silver Medal has almost been lost in the story. I noticed that the coverage of the Marathon medal ceremony did not show his crossed arms on the podium. Behind the political gesture, the neophyte American marathon runner, Galen Rupp (USA) managed to finish third for the Bronze. Ironically, the blue suited guards were there to stop the protest of Brazilians that marred the finish of the Women's Marathon. 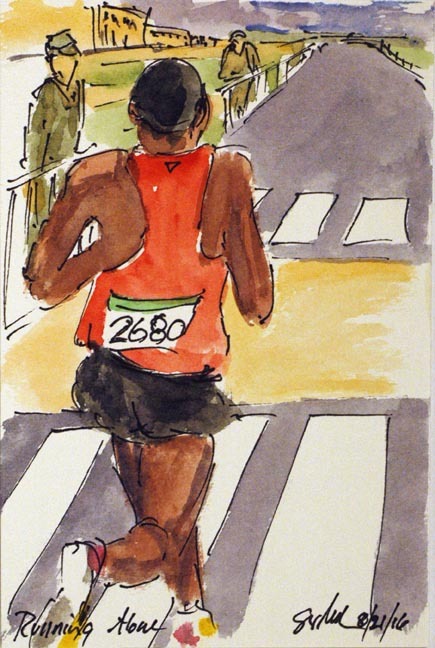 The Kenyan Eluid Kipchoge had spent a lot of the early miles of the Olympic Marathon trying to organize the race to his liking. Oddly he was trying to slow the race down early on, only to leave everyone behind in the last couple of miles. The last two to hold onto his heals were Feyisa Lilesa (Ethiopia) and Galen Rupp (USA). But it was this view, the back of Kipchoge, that everyone who started the race got to see (or a least to see if figuratively). Naturally, Kipchote went on to claim the Gold Medal in the Men's Marathon. The American, Galen Rupp was the only non African runner at the business end of the Men's Marathon. 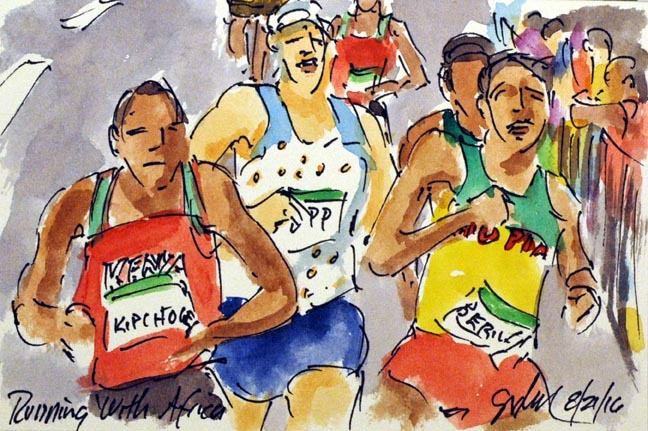 As the group dropped runner after runner, the neophyte found himself in the company of a very elite group that was down to the two Ethiopians, Berhanu and Lilesa and the Kenyan, Eluid Kipchoge. The quartet was roughly twenty miles in, now the real racing can begin. 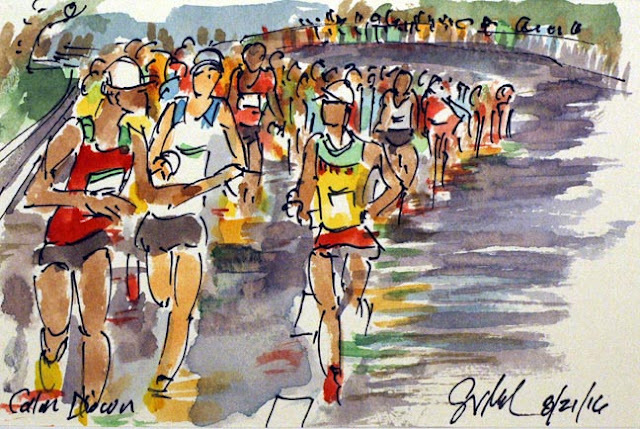 I seem to remember that in my youth the Men's Marathon's finish signified the start of the closing ceremonies. That could just be a hazy memory of youth, but it is one of the very last events of the Summer Olympics. With the pace a little slower than was expected for the early kilometers, the pack was still rather large ten kilometers in. On the front of the crowd, Eluid Kipchoge (Kenya) seemed to be gesturing for L.Berhanu (Ethiopia) and Galen Rupp (USA) to slow it down. Given the Kenyans prowess in this event, one would think he would want the pace to be as high as possible. This seems to be the Olympics for the elderly, Well for the older athletes. Ruth Beitia (Spain) is thirty seven years old. This is her third appearance in the Olympic Women's High Jump where she had yet to win a medal. Tonight, she changed all of that by winning the Gold. Now that is the way to wash away all of her previous disappointment. Just after her unsuccessful third attempt at Beitia's height, the American Chaunte Lowe rushed over to give the Spaniard a heart felt hug. Lowe has also not medal in several Olympics, but did not resent her competitors success. Yet another example of the Olympic Spirit (and the compassion of female athletes). Setting up the anchor of a relay is all about building up a lead in the previous legs, a solid foundation of the win. 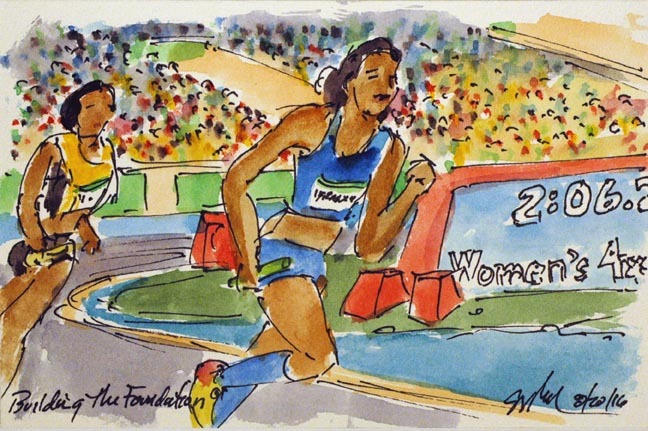 Phyllis Francis (USA) did just that for her countrywomen. Francis was able to extend the lead over Team Jamaica that she had been handed at the first baton pass. Team USA and Team Jamaica made it look like they were the only two teams on the track such was their lead over the rest of the field. 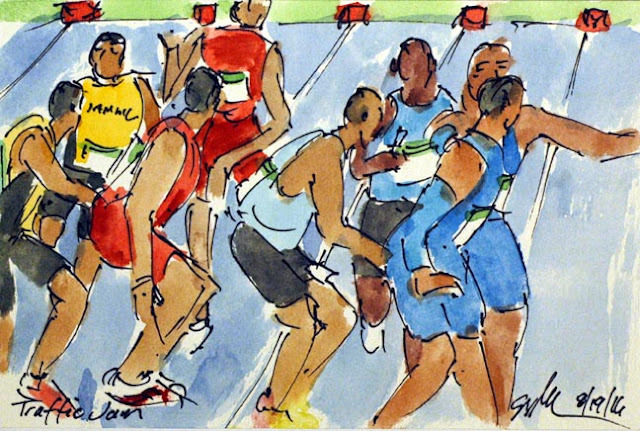 The Americans were able to carry their lead all of the way to the end for the Gold Medal, with the Jamaicans taking the Silver. For all I know, we are still waiting for the Bronze medalist to finish. The announcer for NBC Olympics seemed to be getting very frustrated with how everyone was racing. It was his possibly considered opinion that no one was racing in such a way as to be able to beat Mo Farah (Great Britain). No one did. The American Paul Kipkemon Chelimo crossed the line in the Silver Medal position with the on of the Ethiopians, Hagos Gebrhiwet, coming in third. Chelimo was told during his post race interview that he had been disqualified. His reaction was genuine and amazingly not obscene (I guess he remembered he was on international TV). 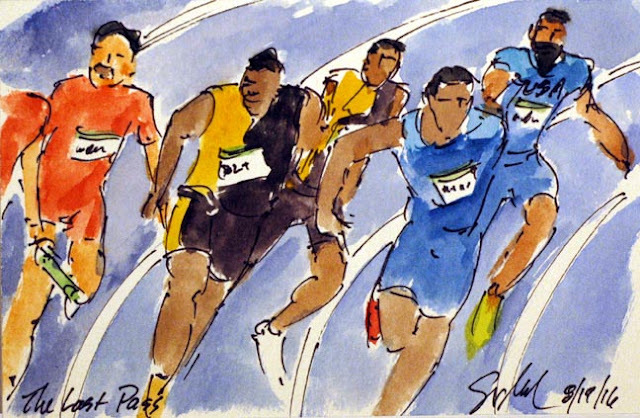 With all of the elbowing and pushing, he had stepped on the line of the edge of the track. 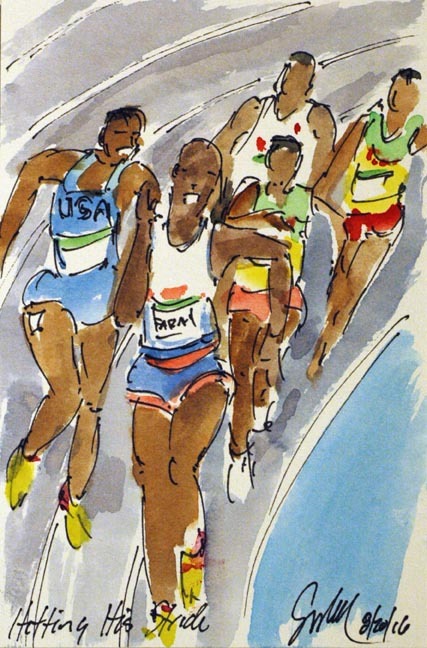 His DQ along with three others, moved his teammate Lagat into third. Later in the evening, he was reinstated (I don't know about the others) and was allowed to stand on the second step of the podium and receive his Silver Medal. Farah has now taken Gold in the 5000 Meter and the 1500 Meter races for the second consecutive Olympics. The American Matthew Centrowitz had led the entire back around the oval lap after lap after lap. The question was, would he still be leading when it mattered? Happily the answer is yes. It was fun to watch his father in the stands going nuts with delight at his son's achievement. Centrowitz is the first American to win the 1,500 M race since 1908. That is a one hundred and eight year drought. Taqufik Makhloufi (Algeria) is making his move on the outside. A move that won him the Silver. Tucked in about mid pack is Nicholas Willis (New Zealand) who negotiated the traffic to take the Bronze Medal. Without much time left to race, Catherine Pendrel (Canada) took off in search of those ahead. 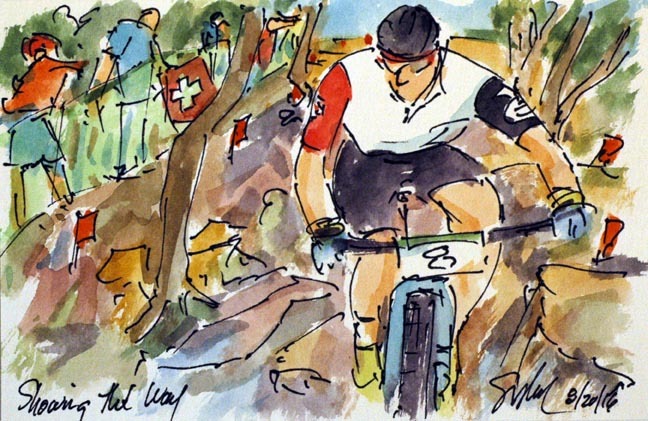 She had dropped the last of the Swiss riders, Jolanda Neff and her own teammate Emily Batty. Pendrel wasn't able to catch either Maja Wloszczowska (Poland) nor Jenny Rizzveds (Sweden), but she did garner herself a Bronze Medal on the day. 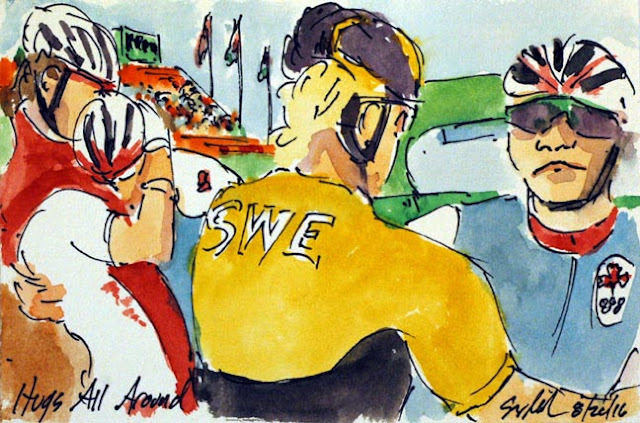 Unlike the Swiss woman who had gone off early in the race, Jenny Rissveds (Sweden) had kept herself in check. She stayed near the front, keeping a close eye on each of the race leaders without putting herself on the front until it mattered. 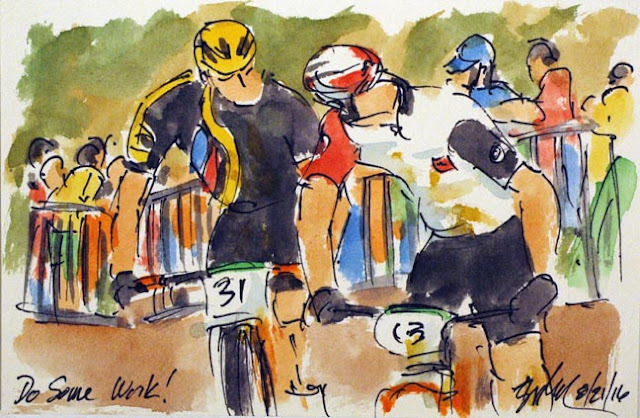 With just a lap and a half to go, she made her move on the Polish rider, Maja Wloszczowska. 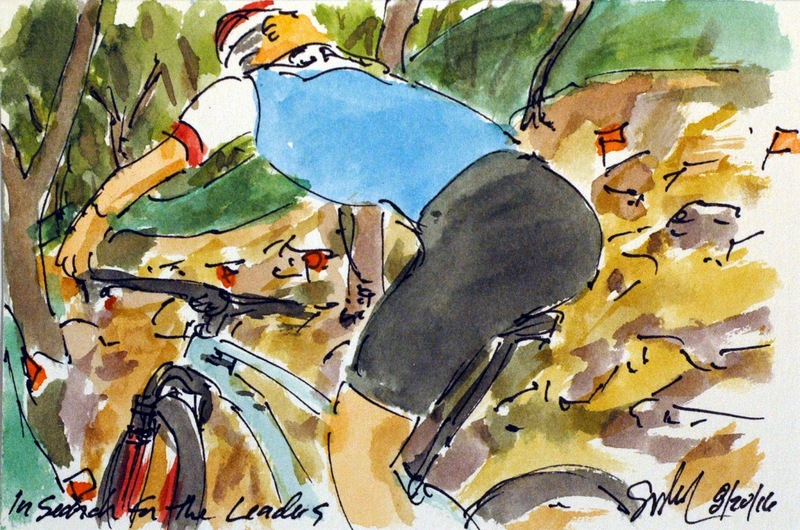 She quickly distance the eventual Silver Medal winner riding alone to the end of the race and claiming the first Olympic Mountain Biking medal for her country. And it was Gold! 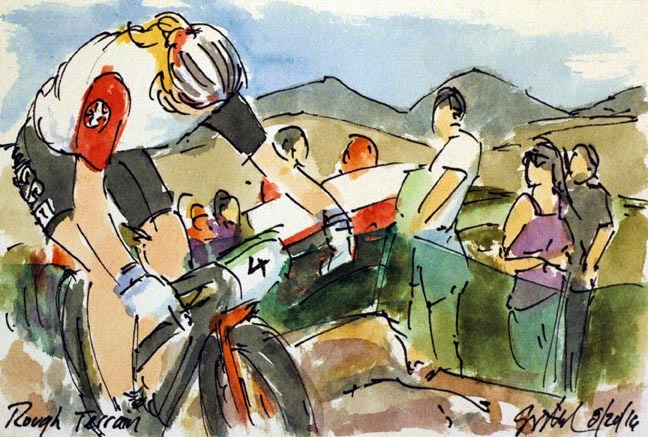 Jolanda Neff (Switzerland) road behind those chasing her teammate Linda Indergand. Once Indergand had been caught it was Neff's turn to carry the flag for her country. The fans along the road had seen their Polish countrywoman ride by, showing her the Polish flag as she did so. They seemed a little disinterested in the Swiss woman chasing their girl down. Neff was never able to catch the wheels of those up the road. The section that she is riding now is strewn with large cut granite, somewhat reminiscent of the early paving of ancient Roman roads. 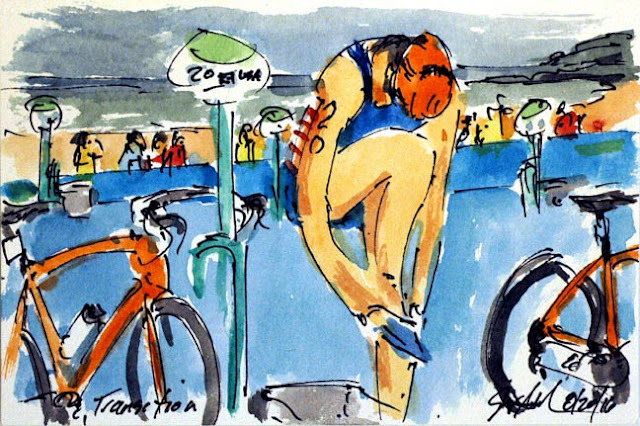 Linda Indergand (Switzerland) let the entire race around the course for two laps. In may have been unwise to go out as hard as she did, but it is always worth the try. Indergand successfully negotiated all of the twists, turns, rocks, climbs and sharp drops of the course. In fact, I don't recall seeing any of the women crash. Now that may have been a factor of the television coverage, although they tend to love to show the spectacle of the mayhem. 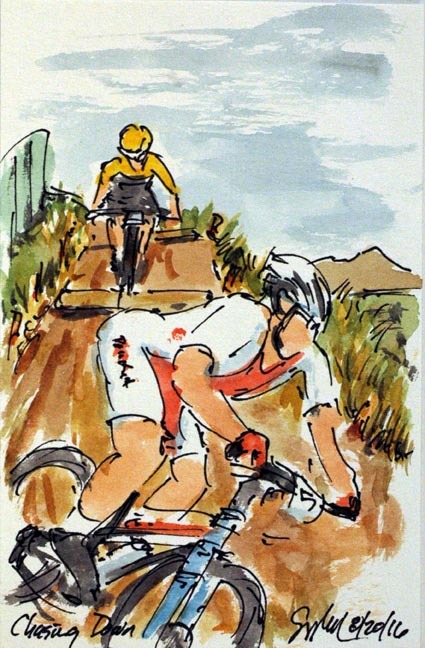 The Swiss rider, Linda Indergand, had gone off the front from the very start of the race around the six laps of the Olympic Mountain Bike course. 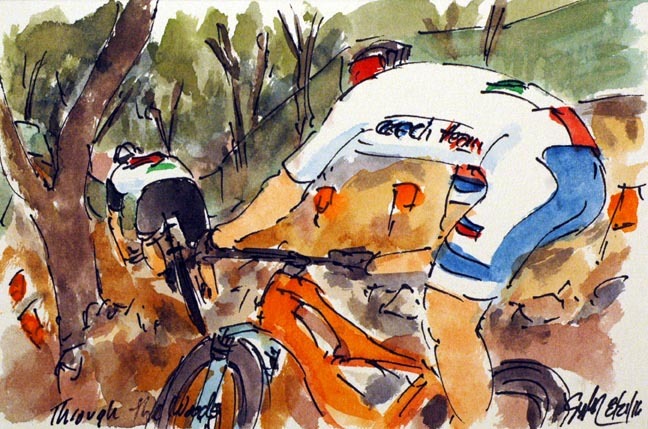 Trying to get on terms with the fleeing Indergand, was Maja Wloszczowska (Poland) followed by Jenny Rissveds (Sweden). The duo had trouble reeling the Swiss woman back in for a full two laps. 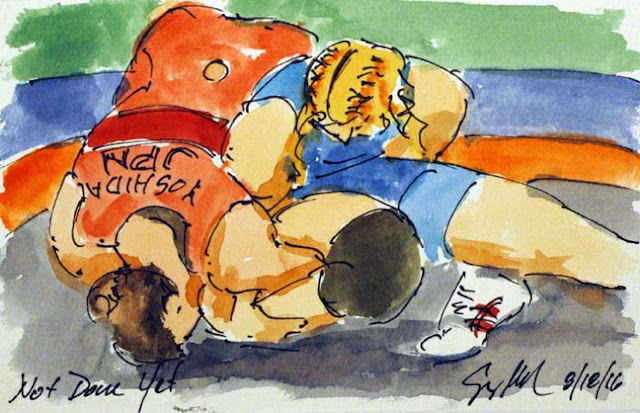 When I was young, there was a weekly sports show that included the line, "the agony of defeat" in its introduction. 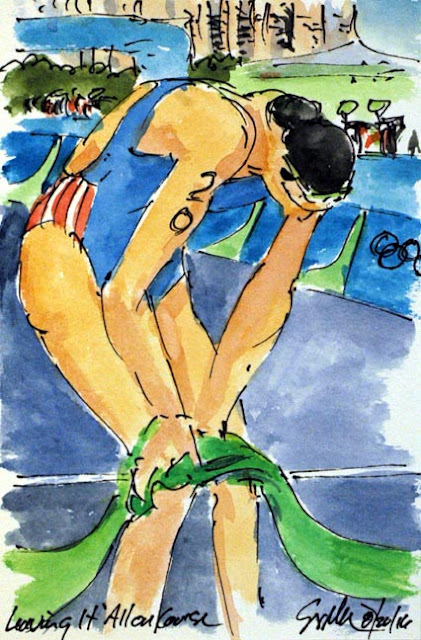 Today, as I look at the clear suffering of Gwen Jorgensen as she crossed the finish line in the Women's Triathlon, I think it should be, "the agony of victory!" Jorgensen dropped the last competitor, Nicola Spirig (Switzerland) with about two kilometers left to run. 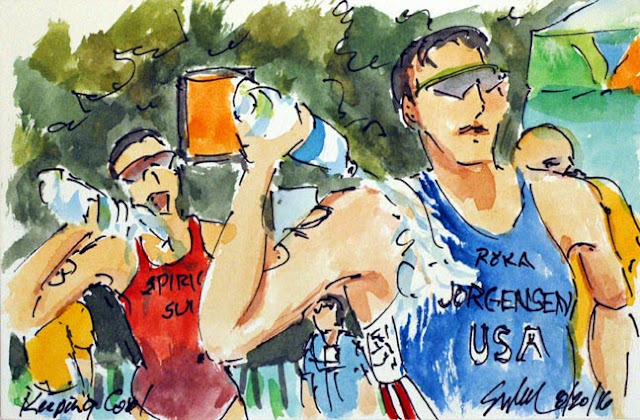 The Swiss woman held on to her advantage over the rest of the field to claim Silver, but it was Jorgensen for the Gold. The first ever for an American woman in the Triathlon. She held onto the ribbon at the line, first clenching it to her knees as she tried to catch her breath, and then aloft in victory. I never did see her let go of it, I imagine it will be next to her Gold Medal in her trophy case back home. There are many things to manage during the triathlon, but keeping one's core body temperature down is perhaps the most important. As these two leaders, Gwen Jorgensen (USA) and Nicola Spirig (Switzerland) run pass the aid station they dowse themselves with water. Spirig tries to dowse and drink and the same time. This duo has left everyone else far behind, maybe as much as fifteen seconds back. With the swimming and now the cycling completed, it was time for Gwen Jorgensen (USA) to make the final transition to running. The riders have to dismount and run with their bike to their respective gate, remove their helmets and any other gear. The gear must be placed in the waiting box, where there will be whatever gear the may need for the run to the line. 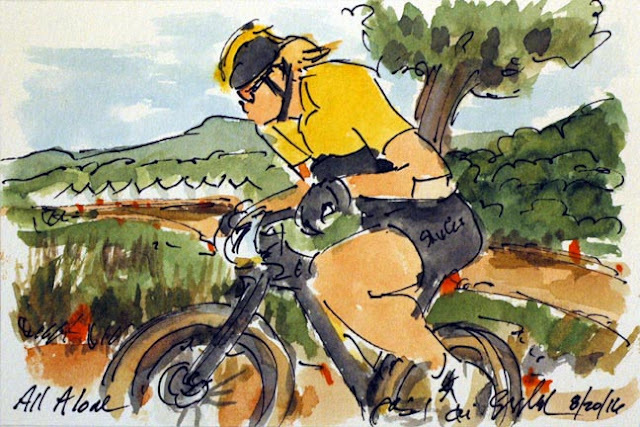 Most riders will grab sunglasses (if the cycling ones are not to their liking) and some will pull on a hat to shade their face. Naturally, they have shed the cycling cleats. Those have been left attached to the pedals, and now they slip on their running shoes. The bike leg of the Women's Triathlon was seeing the cream of the crop rise to the top, and the riders were rising to the top of the climb as well. Nicola Spirig (Switzerland) lead the lead peloton up with the Chilean, Riveros on her wheel followed by the Amerian, Gwen Jorgensen. All of these women were fearing the running leg of the American, so they were hoping to gain some time on her while on two wheels. 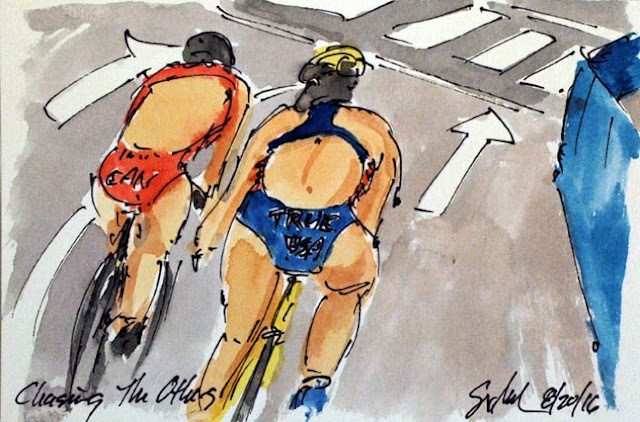 In the Olympic Triathlon, drafting is allowed during the bike leg, but it seems no one was truly using the technique to their advantage. It upsets me to look at riders with so little covering their skin. I won't even ride without gloves, I prefer to keep my skin on my body and not leaving it on the road. Sara True (USA) and Kristen Sweetland (Canada) were trying to catch back on to the leading peloton. True was having a bit of trouble with the one short steep climb on the course, or perhaps it was the equally steep descent. True eventually withdrew from the race with horrible quad cramps. I have been there, I know there is simply nothing she could do to continue, try as she might. A rough way to end your Olympic dreams. The Women's Triathlon started on the beach of Copocabana, with the women running out into the surf for the swim portion of the race. I was struck at how much the "peloton" looked like a school of fish as they made a turn around on of the buoys that mark the course. The women were just setting out on a two hours or more all out physical effort. 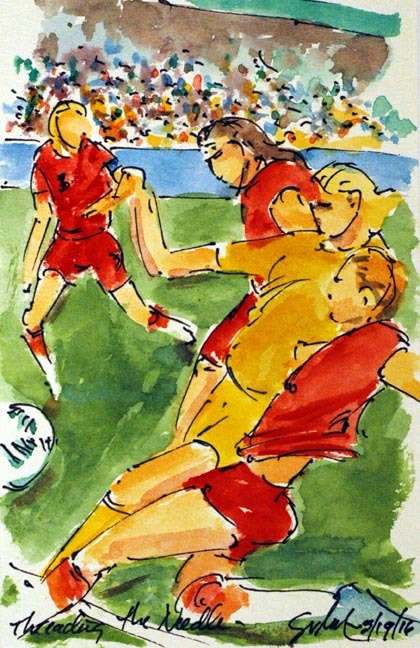 The German and Swedish women played a scoreless first half in the Gold Medal Match of Olympic Football. Germany scored the first of two goals just four minutes in to the second half. Sweden played hard and put a finely placed pass into the net to come within one point of the Germans. Germany's second goal had been kicked into the Swedish net by one of Sweden's defensive players. With the score now 2-1, she must have felt awful. When the game ended with the same score, I am sure she held her head low. Germany claimed the Gold, but Sweden's Silver is the first time they have ever made it to the podium since women's football was added to the Olympic Games. This might be why I was never a truly successful athlete, had I been one of the Swedish players, I would have gone into the game feeling like I had already won. This leaves only one more full day of competition, since Sunday ends with the closing ceremonies. This has been fun, hard and a lot of work, much like what the athletes have gone through themselves. There are several different ways to look at this title, well, two anyway. This is the last pass in the men's 4x100 relay, the last time the baton changes hands before the anchormen take the race to the finish line. According to Usain Bolt's (Jamaica) own statements this is his last Olympic race, and therefore this is his last baton pass in the Olympics. And boy oh boy did he make it count. This time he left everyone behind despite being the third member of this group to get the aluminum rod from his teammate. And he finished the race of in a new World Record. Team Japan got the baton first, but finished in second winning the Silver. 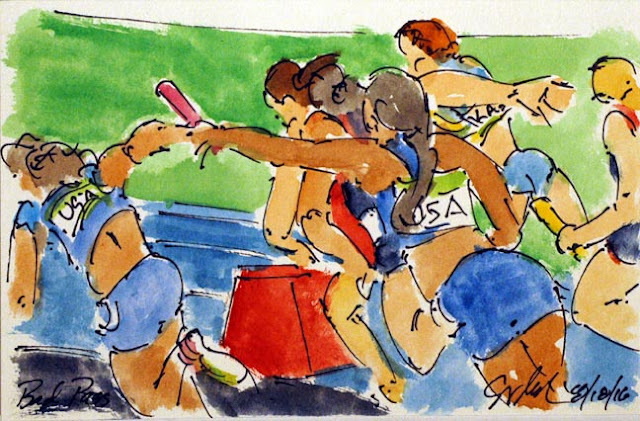 The USA moved up to third, but then continuing the American women's 4x100 woes, were disqualified for a bad baton pass. 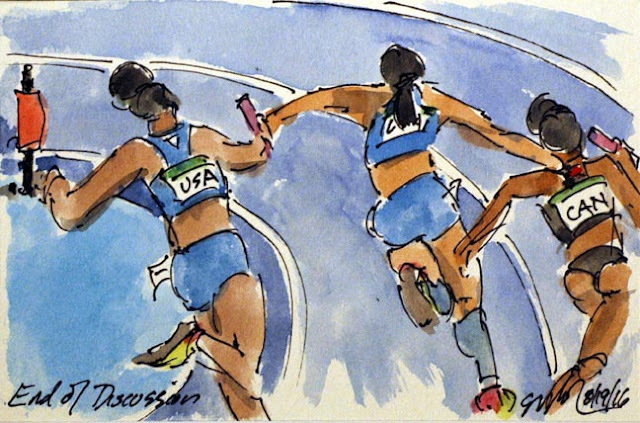 They didn't drop the baton like the women had done in qualifying, they passed too soon, out of the transition zone. So it is Team Canada that gets to take home the Bronze Medal. Now I have that song stuck in my head, do you? 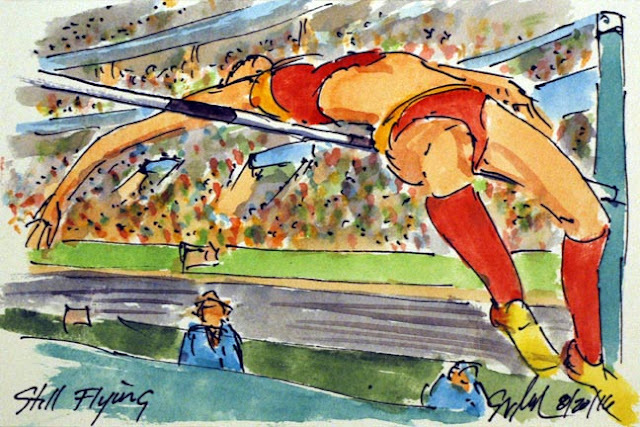 American Pole Vaulter Sandi Morris approached her final attempt with the knowledge that making it meant a Gold Medal, missing she would settle for Silver. She seemed to clear the bar and even started her celebrations on the way back down to the mat below. However she was joined on the way down by the bar. So while it seemed like she made it, she did not. So it is Silver for Morris. Reportedly there was some argument that the American relay team didn't belong in the final. That brought the foursome onto the track with an even bigger attitude than what carried them through there solo qualifying effort. An effort that produced the fastest qualifying time. So Tianna Bartoletta (USA) game out of the starting blocks faster still. She was the first runner to pass the baton to her teammate. Allyson Felix (USA) picked up where Bartoletta left off and so it went around the track. The team finished four seconds ahead of the Silver Medal of Jamaica and the Bronze of Great Britain. While it was a bit rocky getting to the end of the Women's 4x100 relay, there was a Gold Medal at the finish line. After the racers of the 4x400 relay complete their first 400 and the first baton pass, they leave their lanes and race as they have room. That makes for a rather confusing second and third baton passes. 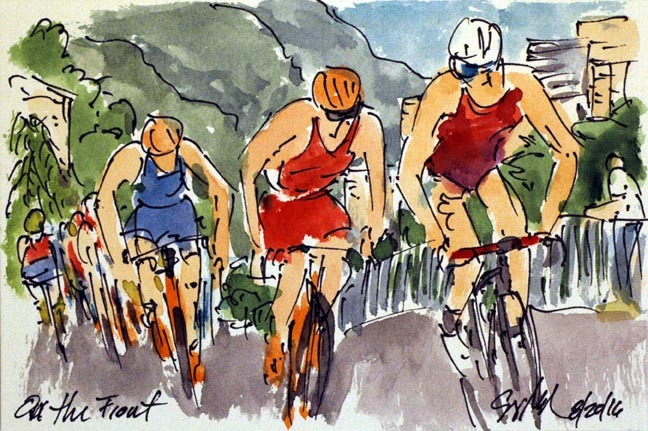 Each of the teams will clump together, hoping to be seen by their teammates as they approach at full speed. Tonight all of the passes went smoothly in the qualifying races. Three out of these four teams qualified for the final, Jamaica, Botswana and the United States. Trinidad and Tabago in red, didn't make it through. I wanted to take on this image because I wasn't at all sure I could do it. 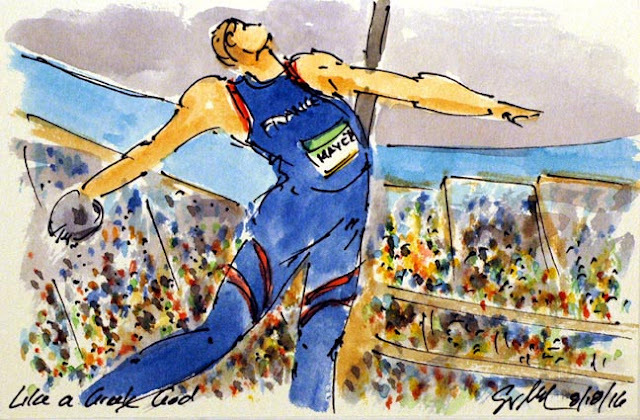 A big part of this project of painting the Olympics has been an exercise in drawing the figure, an act that comprises almost all of my artwork. See what else I have done as you browse my website. This is the ball routine of the leader of the Olympic Rhythmic Gymnastics competition after the first two events. Ganna Rizatdinova (Ukraine) chose to have the color of her ball make a nice chromatic contrast to her costume. My wife has three favorite events in the Summer Olympics, the synchronized swimmers, the women's gymnastics, and this, the rhythmic gymnastics. Or as she calls it the ribbon dancers. Tonight was the first half of the competition featuring routines with the ring and the ball. 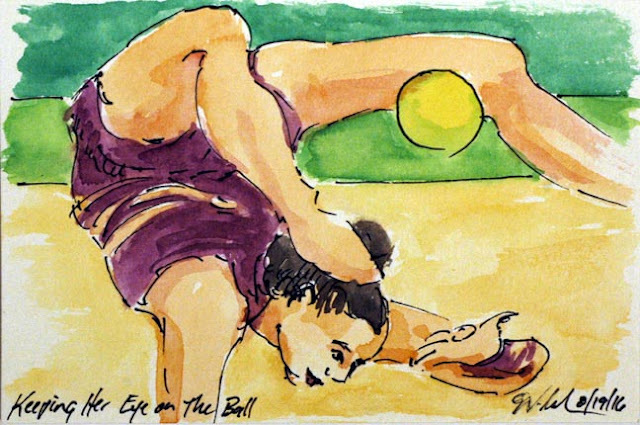 Salome Pazhava (Georgia) did a most elegant routine with her color coordinated ball. 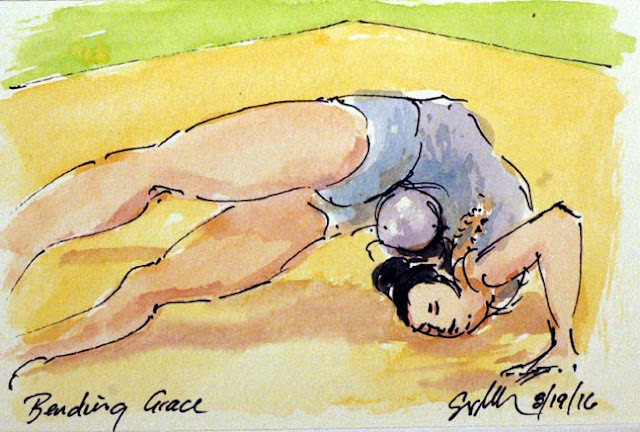 It seems to me that these women are even more flexible than the artistic gymnasts. But then these ladies will not be doing any double back flips. According to the announcers on NBC, each of the teams have a theme to their performances, not that the judges nor audience are told what it is. The Japanese team had center their routine on the idea of fighting the dragon. Some of the movements were very much in keeping with ritual dragon dance moves. And then their swimsuits were a very stylized dragon motif. The Japanese were very thrilled to win the Bronze medal after their powerful and beautiful performance. Just like ice skating, the jumps are the big thing. 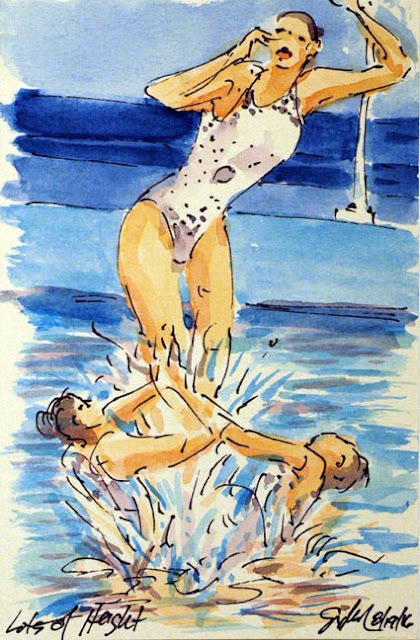 For the Team and Pair Synchronized Swimming events (I guess there isn't an Individual event) the lifts need to be big and beautiful. Plus, the swimmers are never allowed to touch the bottom of the pool. This rather beautiful lift was done by the eight woman team from the Ukraine. This octet moved into second with the performance, but would eventually just miss the podium with a fourth place finish. Considering what the athletes had been through with the Russian invasion of their city of Kiev, it is almost a miracle that they were here at all. I wonder what conversations were had in the waiting areas between them and the Russian team. No not the boy band, although Justin Timberlake is anchoring the late night broadcast on NBCtv. 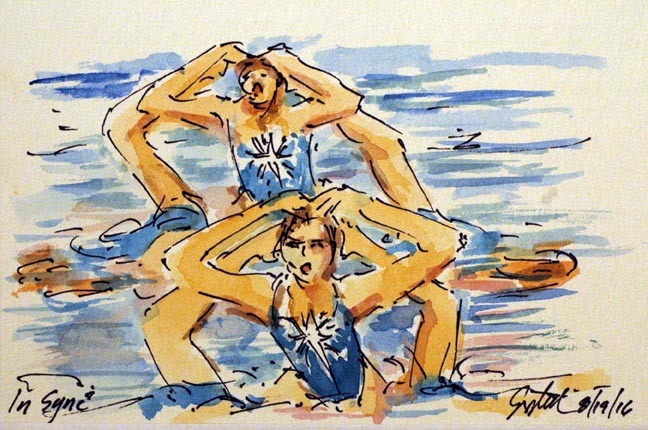 This is the stellar Russian Synchronized Swimming team on their way to the Gold Medal. This particular movement may have been a commentary on what most of their countrymen and women athletes are going through. All of the track and field athletes save one were banned from competing due to a Russian team wide doping scandal. Those Russians (excepting these women) have regularly been booed by the audience. 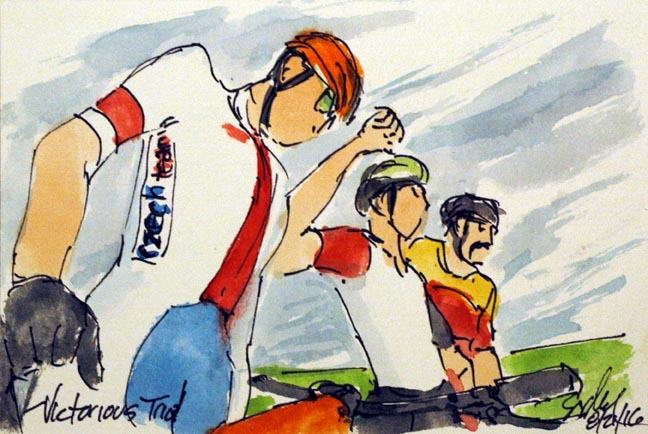 I will admit that I painted this mainly for the orange jacket on the Dutch rider. Maikel Van Der Vleutin (Netherlands) was one of the riders who knocked down a rail on his ride. 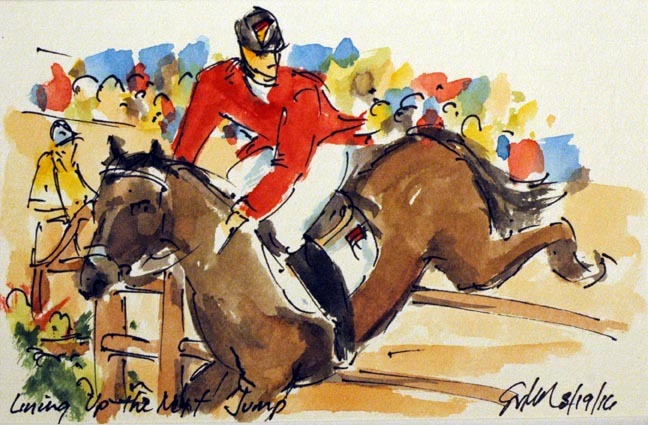 Sadly he did it on the very last gate, and with it his chances of an Olympic medal went with the rail. 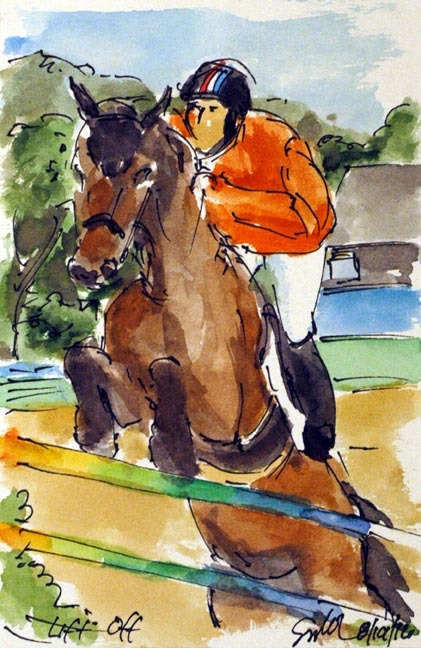 But hey, he has an amazing orange riding jacket, so all is not lost. The Equestrian Individual Jumping is contested in two rounds, this morning first round saw 12 riders get through with perfect scores. One of those perfect rides was the German Christian Ahlmann and his horse, Taloubet Z. Ahlmann is looking towards the next obstacle even has he is landing the last one. The Slovakian Matej Toth made a late surge. 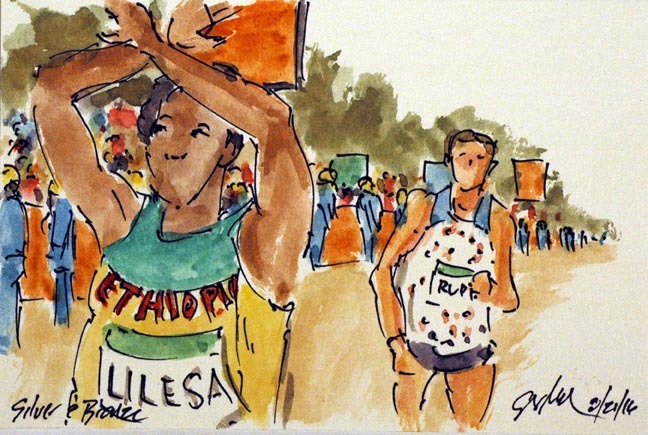 Perhaps he was motivated by his countrymen running alongside the course waving his national flag, cheering him on. He quickly put distance between himself and the Aussie, Jared Tallent. Toth was able to extend his lead and hold it all of the way to the line. He will be bringing the Gold Medal back home. Stopping the action of an athletic moment can lead to some pretty silly positions, but with race walking I don't think that there is ever a moment with the contestant doesn't look a little bit silly. Not that I want to cover 50 kilometers in three and a half hours, unless I can do it on by bicycle. 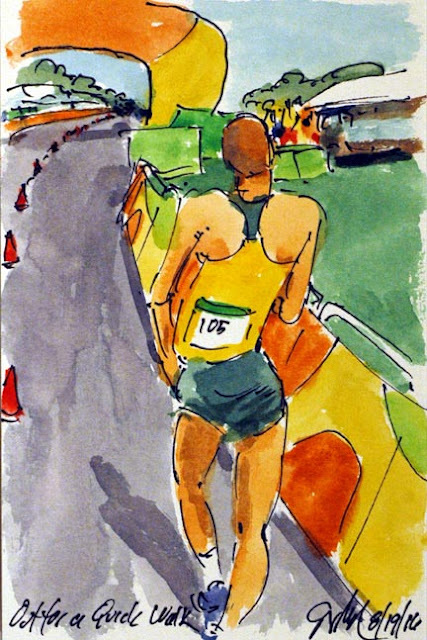 Jared Tallent (Australia) took over the lead with a little less than ten kilometers left to race. It was looking like he would be a sure thing. He was hoping to defend his 2012 Gold Medal that he just received due to a recent positive doping test of the Gold Medalist from the London Olympics. Tallent had finish second four years ago, but got moved up with the disqualification. So, back to the American Women's 4x100 Relay race. Team USA had protested that Allyson Felix had been run into by a Brazilian runner just as she was passing the baton to English Gardner. That was the reason for the dropped baton and the Americans losing the relay and the chance to compete in the final. The protest was sustained, but now how to have them race for a placing in the final? It was decided to have them run their race in their original lane assignment on their own, no one to compete with or measure one's self against. So with the entire arena watching, the team raced around the track alone. Not only did they qualify for the final, even racing on their own, they posted the fastest time in the revamped semi finals. For the record, Team Brazil was disqualified for crossing out of their lane, but then they hadn't made it through to the finals anyway. 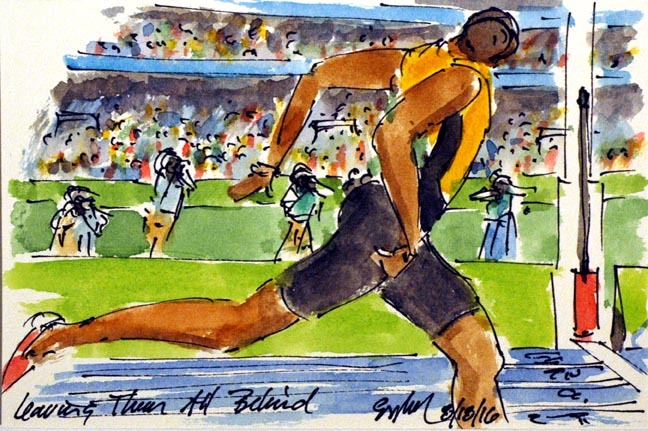 Usain Bolt left know doubt that he is the world's fastest and longest reigning sprinter. Bolt went out in search of his third double Gold Medal in the Athletics sprinting events. He had already won a third consecutive Gold Medal in the Men's 100 Meter Dash, so it should come as no surprise that he was able to do the same in the 200 Meter race. However no one expected him to leave such a gap that no one else is even in the frame. Bolt's only disappointment is that he didn't break his own World Record. Gee, gosh, my heart bleeds for him... I thought that he was mugging for the photographers as he crossed the line, but no, he was checking the clock beside the track. The top three places in the Decathlon were keeping a close eye on each other over the 1,500 meters of the final event. 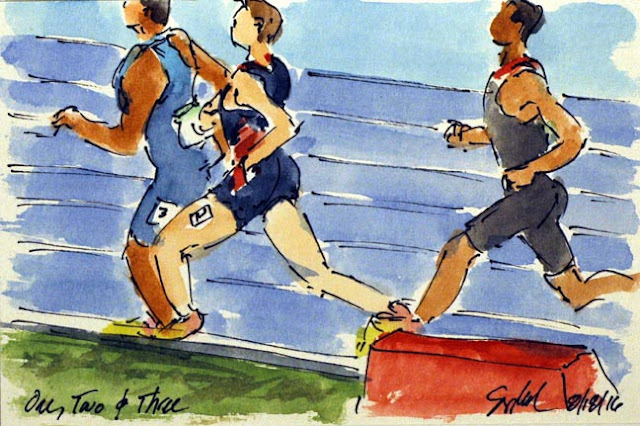 The trio of Ashton Eaton (USA), Kevin Mayer (France), and Damian Warner (Canada) entered the final turn running in their same placings as their standings in the Decathlon. The final event did nothing to alter the standings. So it is Eaton successfully defending his Gold Medal winning the 2016 Olympic Decathlon. And Kevin Mayer used his final events to finish with the Silver Medal, leaving the Bronze Medal for Canadian Damian Warner. Frenchman Kevin Mayer was like a man on fire in the closing events of the Men's Olympic Decathlon. 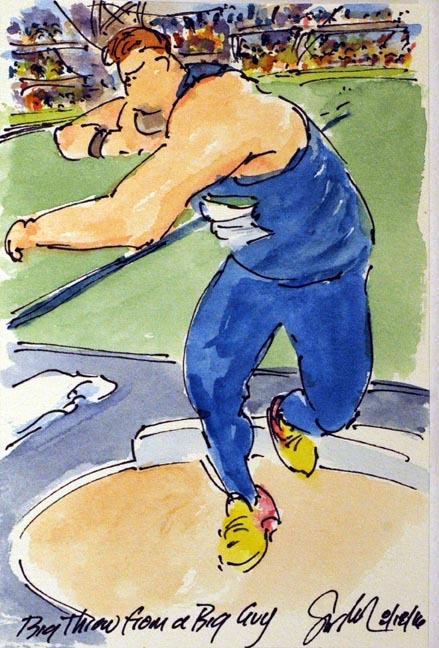 He had posted the longest throws in both the Discus and the Javelin. The question remained, did he have it in his legs to put over seven seconds into the American Decathlon defending Gold Medalists to steel the top step of the podium in the final competition. After nine events in less than 37 hours, the athletes would end the Decathlon with a 1,500 meter race. A cruel finish to a grueling event. All Shot Put athletes are big, but Ryan Crouser (USA) adds height as well as girth to the equation. At 6.7" he could be playing basketball, but instead as gone into the family business. Crouser spun his way into a new Olympic Record of 73' 10 1/4", clearly enough for the Gold Medal as well. The Americans ended the night taking both Gold and Silver in the event. The United States women may have been out jumping Serbia, but the Serbs were out playing the Americans. 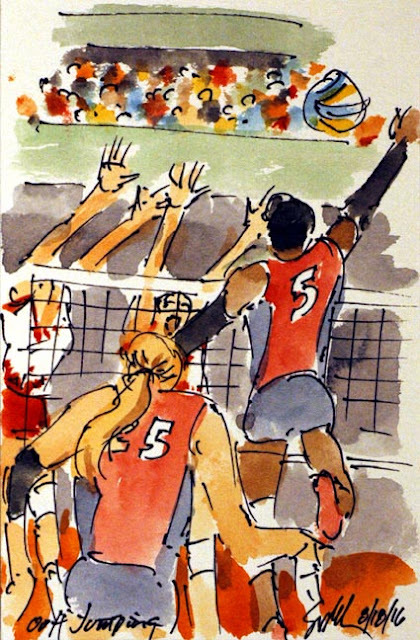 The two teams traded sets, but since Serbia had won the first set, it followed that they won the fifth and deciding one. The USA will play for the Bronze Medal against the Dutch. The Serbians will take on the Chinese for Gold. Yet again, there is a reason you actually play the match. Saori Yoshida (Japan) had only lost two matches in the last fourteen years and she was going up against a young American, Helen Louise Maroulis. Maroulis went into the final couple of minutes with a couple of points lead, but early Japanese matches had been won in the final seconds of the final round. So while Yoshida was behind, the match wasn't over yet. But instead of the star of Japan getting a take down, it was the American Maroulis who scored with just two or three seconds left. With that, all she had to do was dance away until the final bell and the Gold Medal would be hers. The first Gold for the United States in Olympics women's wrestling. Yoshida did get the Silver, but she cried throughout the Medal Ceremony. Somehow, Allyson Felix (USA) fumbled the baton pass to her teammate, English Gardner. At first they stood on the track trying to figure out where the baton was, and what they should do now that they were out of the race. Felix gestured that they should finish out the race, and wisely it was her that went and picked up the pink aluminum rod. 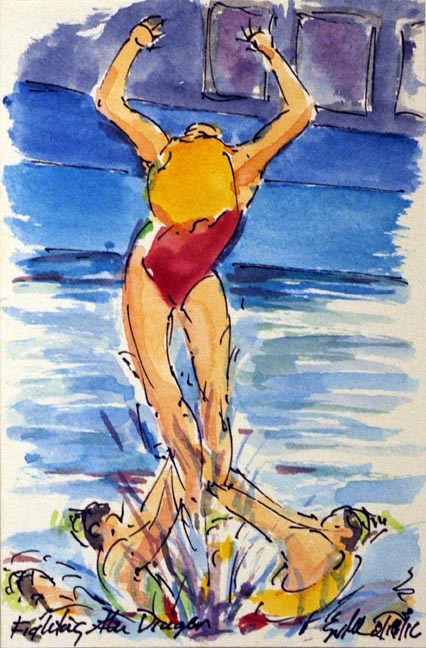 She handed it to Gardner, who continued the relay. By so doing, they were able to protest the results. 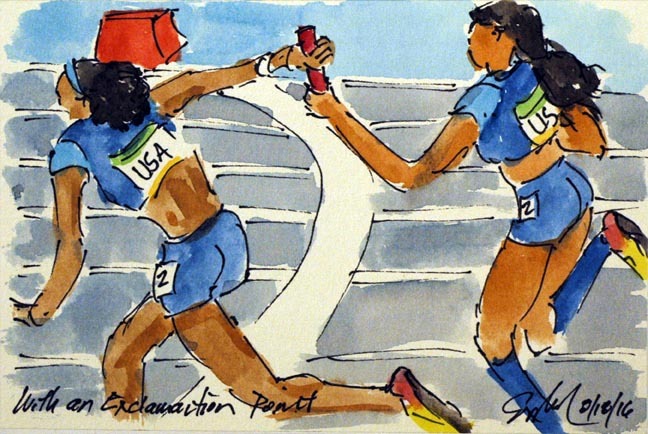 The Brazilian team had entered the Americans lane and pumped Felix as she reached out for the baton pass. 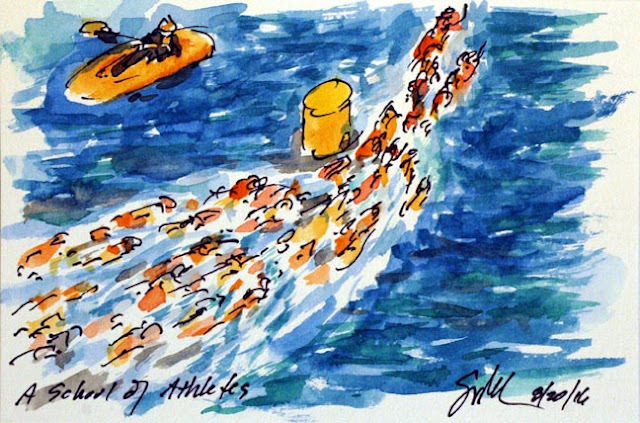 The IOC agreed with the protest, but how would it be resolved? That is what I thought as I finished up this painting. I guess the discus and the relationship to the original Olympic games may have influenced me just a bit. The Frenchman, Kevin Mayer was on fire on the second day of the Decathlon. He had the longest throw of all of the Decathlon competitors, a throw that moved him back into third overall. 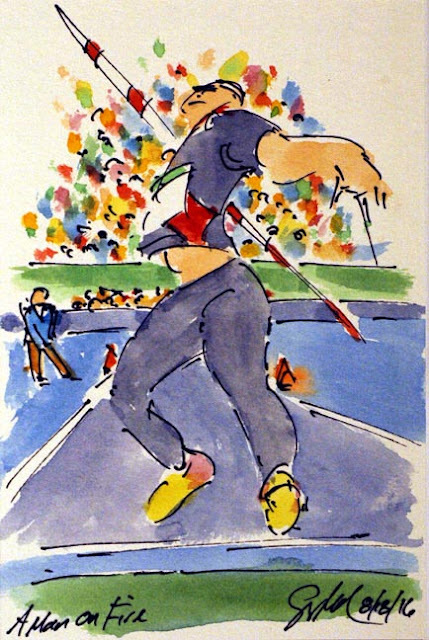 The Frenchman had just the Javelin and the 1,500 meter race to complete the ten events that give the Decathlon its name. Rio Olympics: Is V for Victory?